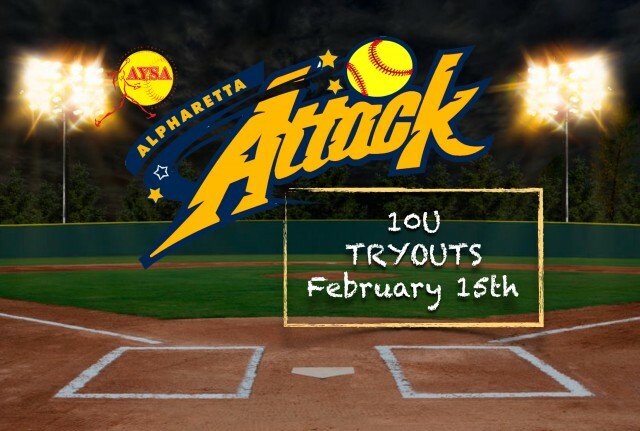 Updated Wednesday February 13, 2019 by Alpharetta Youth Softball Association (AYSA). Weather permitting, we will be holding our 2nd 10U Attack tryout this Friday evening, February 15th, 6-8pm on Field 6. Interested girls must be registered for the AYSA recreation league to participate. The Spring Select All-Star season games will begin on Sunday March 17th and will end on May 5th with the End of Season Recreation Tournament. The Summer All-Star season will begin after the Spring End of Season Recreation Tournament. We will hold separate tryouts for Summer Attack teams.